Impasses inevitably arise in any relationship. The question is how you negotiate them. Meta is my favorite prefix. It refers to whatever follows it: meta-cognition means thinking about thinking, or a meta-blog is a blog about blogging. Meta-incompatibility means incompatibility about incompatibility. If you and your partner negotiate incompatibilities using different styles, tactics, tones, and strategies, you have a meta-incompatibility problem—an incompatibility in how you negotiate the incompatibilities. There will be incompatibilities in any relationship—between husband and wife, lover and lover, parent and child, friend and friend, colleague and colleague, boss and employee, teacher and student. Since incompatibilities are inevitable, your relationships’ sustainability will depend on how you negotiate your incompatibilities, the impasses that inevitably arise. Remember the card game War and how you handle it when two people put down the same cards simultaneously causing an impasse? 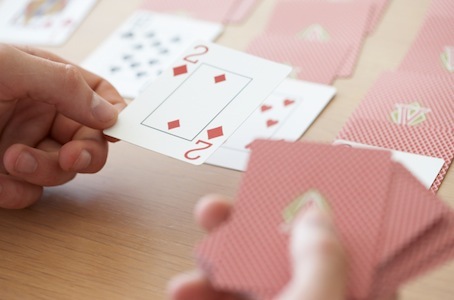 You break the impasse by escalating, each putting three cards face-down and one card facing up on your tied cards, the higher top card winning all the cards. You break the impasse with a meta-competition, a competition about the competition between two tied cards. If you and your partner want to do different things together this evening, this weekend, this year or with your lives, you’re at an impasse, an incompatibility that has to be decided by escalating to a higher or meta-level. If your ways of deciding at a meta-level are incompatible, you’ve got a problem, just as in War, you get to an impasse and your partner insists on a different method for escalating to resolve it. When push comes to shove, do you and your partner push and shove differently? Do either of you use techniques the other doesn’t trust? If so, you may be meta-incompatible. It’s another way of saying we think someone doesn’t fight fairly. You probably won’t know whether you’re meta-incompatible until push comes to shove. Your partner was easygoing until you hit a particularly serious impasse, and now you’re amazed by the strategies he employs. Most of us pledge we wouldn’t use certain “unfair” techniques, forgetting or ignoring that actually we do when in our eagerness to prevail they become irresistible. Very few of us are thoughtful or precise about our pledges to fight fairly. We pledge ourselves to any moral standard that sounds virtuous, but often our pledges are so loosely worded we can always deny violating them in practice. In conflict, when the stakes go up, we tend to apply our moral standards selectively, a double standard. Your partner, for example, has pledged not to be “critical,” whatever that means, and accuses you of being critical of him, yet can’t see the places where he is critical of you. War is generally a boring game, the highlights being those little escalations. I remember a few times when as kids we tied, escalated, and our top cards were tied too, which thrilled us no end, and called for another escalation. That’s a meta-meta-competition, a fight about a fight about a fight. Once I even got to a meta-meta-meta-competition, and had to escalate yet again. Likewise, you can reach an impasse in negotiation, each of you accusing the other of not fighting fairly. Maybe you think your partner fights so unfairly that you give up, but your partner says giving up is totally unfair. At that point you’re dealing with meta-meta incompatibility. You: This is futile. We don’t see eye to eye. Your partner: It’s not futile. We’re at an impasse but we should be able to negotiate it. You: I disagree. I think you fight dirty. Your partner: If anyone fights dirty, it’s you. I think we just need to keep talking until you become more reasonable. You: I don’t. I don’t think we’re getting anywhere. Your partner: How can you pull out? That’s totally unfair and wrong! You: Well then, I guess we have incompatibility about our incompatibility in negotiating our incompatibilities. See, the prefix meta can be added over and over without limit. Meta-meta-cognition is thinking about thinking about thinking, which may seem the depth of navel contemplation, but is pretty common actually. Indeed, whenever you think about meta-cognition, you are engaged in meta-meta-cognition, thinking about thinking about thinking. Why bother thinking about these meta-levels? Well, for one thing we can’t help visiting them. They’re uncharted territory, but not unfamiliar territory. Charting them can help you navigate them. Jeremy Sherman is an evolutionary epistemologist and a contributor to Psychology Today.